“It’s a night like any other on board the Icarus. Then, catastrophe strikes: the massive luxury spaceliner is yanked out of hyperspace and plummets into the nearest planet. Lilac LaRoux and Tarver Merendsen survive. And they seem to be alone. I first imagined this book to be a sort of “Titanic in space”- and while that was true at first, I don’t think that’s an accurate comparison. This novel is a story of survival, suspense, science, romance, and the gap between the elite and the lower social classes. It’s so much more than that three word phrase can encompass. For the majority of this book, Tarver and Lilac are the only characters present. I mean this literally, since they are the only people on the planet where the ship crashes. At first I thought this would make the book really boring, considering there’s only so much that can happen between two characters. BUT BOY, WAS I WRONG. The fact that there were only two characters meant that the potential for immense character development was possible, and the authors took full advantage of this opportunity. The Lilac and Tarver of the beginning of the story would hardly recognize the Lilac and Tarver of the end of the story if they ever were to meet. The character development happened gradually over the course of the novel and at what I thought was a realistic pace given their unusual situation. It also helped that the story was told from both of their perspectives through alternating chapters. I loved watching their relationship transform from mere acquaintances to basically soul mates. The chemistry between them felt real and not forced, and personally I think they were perfect for each other. 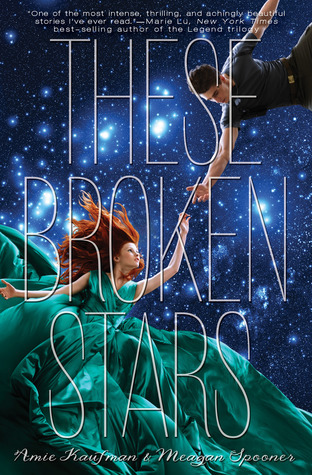 A major positive aspect of These Broken Stars is that it’s not your average young adult science fiction novel. The lack of a multitude of characters for a large portion of the story meant that it wasn’t a confusing whirlwind of constant action, like so many other books in this genre that I have read. It was a survival story more than anything else, and the characters became the focal point rather than grand events and plot twists. That’s not to say that there weren’t any plot twists (because there were) or action (because there was), but as a reader I found myself caring more about the welfare of the characters than anything else. With that being said, I did enjoy the scientific and supernatural elements of this book as well. Because of the perspective this book was written from I felt as though I was learning everything along with the characters. This helped make me feel more involved in the story. Overall, this was a great book! My only complaints were that it was slow at times (particularly in the beginning) and that there were some twists that I suppose were meant to be surprising, but were actually quite predictable. Other than those two things, I thoroughly enjoyed this novel! Would I recommend it to a friend? : Definitely, especially a friend who likes Doctor Who or Star Trek. I read this book a few months ago and really enjoyed it. It is like a breath of fresh air among YA novels.